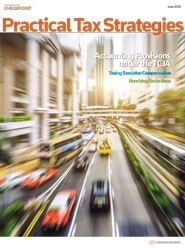 Practical Tax Strategies alerts readers to timely tax issues, focusing on practical strategies to reduce client taxes and satisfy statutory and regulatory compliance mandates. Practical Tax Strategies provides easy-to-read analysis and innovative planning strategies that can be used by the seasoned tax professional looking to expand his or her expertise, as well as non-tax practitioners in need of coherent explanations for complicated tax concepts and changes. Articles are written by tax practitioners who understand the real-world demands of servicing clients. Concise summaries of recent developments are arranged by subject areas and slice into the ever-changing tax scene.